1.Smearing the medicinal liquid glue(polyurethane) equably and repeatedly on the aluminous head mould, then put in the drying machine for 2-3 hour until the glue congealed. Take out the head mould and smear the medicinal liquid glue again, put it back to the drying machine for 2-3 hours. In this way, repeat the above processes for 5 times. It totally takes about 11 hours to complete the PU membrane; 2.Taking down the PU membrane and pin up the PU membrane on the plastic head mould with a gauze, in order to stuck the PU membrane horizontally and vertically across the top of the plastic head mould; 3.Draw the overall size and design the rough sketch on the PU membrane; Normally, our toupee have 4 regular sizes: 6*8, 7*9, 8*10, 9*11. The customer may also tell the specific size and we can customize; 4.After designing the size and pattern, cover a mono net over the PU membrane and nailed it on the plastic head mould, the mono net is a light brown color fine mesh, to where the hairs are individually hand tied. 5.Using the white adhesive tape to design the pattern, the mono area surrounded by the adhesive tape is for covering the PU. You can also design the pattern by yourself; 6.Smearing the medicinal liquid glue on the pattern area that pasted by the white adhesive tape, including the tape area in order to stick the mono net and the PU membrane together; 7.After smearing the glue, put in the drying machine for 2-3 hours, until the glue congealed; The temperature of the drying machine is about 40-50 degrees to 100 degrees. 8.Take out the head mould, trim the rest of the mono net that not in the pattern area; and the mono net were cut off are useless, can not reusable, so the material cost of a toupee is not cheap. 9.Pin up a lace net in the front of the head mould horizontally. Use the adhesive tape to design the sketch again; and then smear the glue on the pattern area that paste by the white adhesive tape, including the tape area again, after the above processes, put in the drying machine to congeal the glue again. After 2-3 hours, take out the head mould, rip down the white adhesive tape, then the glue will congealed as the pattern and stick on the silk net in the front. 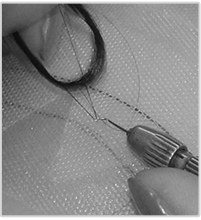 10.The last step of finishing a base is smearing the glutinous rice glue all over the mono net and the lace net in order to protect the PU membrane not being damaged during knotting and guarantee the hair appearance will look good; 11.When the base is done, draw the hair directions on the inner base; We need to follow the direction of the human hair growing, otherwise, if we disorder the hair growing direction, the hair of the toupee will easy to knot, tangle and not smooth. 12.Ventilating the hair one by one to the mono net and lace net according to the hair directions. This requires the craftsman need to be very patient and careful. The process of Ventilating hair may takes 3-4 days, it's 100% hand tied. 13.After 3-4 days hair knotting. Examine the hair: whether the weight is the same? Whether the hair density is 130% or as customer required? Whether the hair line looks natural or not? 14.After careful examination of the hair and the PU membrane. Cut down the toupee from the head mould; 15.After 6 days of non-stop production. A piece of toupee is finally finished. The toupee in above picture is the most popular style in our series, the Sunny style. 16.Use a elastic light net to carry the toupee in order to avoid the hair tousled and protect the hair piece. Pack it into the plastic bag and put in storage. Wigs are worn for either prosthetic, cosmetic, or convenience reasons. People who have lost all or part of their own hair due to inllness or natural baldness can disguise the condition. For strictly cosmetic reasons (or pwehaps to alter their appearance), perple might wear a wig to quickly achieve a longer or fuller hairstyle or a different color. In an article in Vogue magazine, the wife of a prominent politician was described as usinig a wardrobe of wigs to avoid $8,400 and 160 or more hours spent with professional hairdressers each year, in addition to the complicated task of finding appropriate hair care while traveling. While wigs have a very long and somewhat traceable history, the origin of the "toupee" is more difficult to define, but one can reasonably infer that the first toupee was a piece of hair, worn on the head, with the intention of deceiving the viewer into believing the hair was natural, rather than a wig worn for decorative or ceremonial purposes. In the United States, toupee use (as opposed to wigs) grew in the 19th century. One researcher has noted that this is in part due to a shift in perceptions over the perceived value of aging that occurred at that time. Men chose to attempt to appear younger, and toupee were one method used. By the 1950s, it was estimated that over 350,000 U.S. men wore hairpieces, out of a potential 15 million wearers. Toupee manufacturers helped to build credibility for their product starting in 1954, when several makers advertised hairpieces in major magazines and newspapers, with successful results. Key to the promotion and acceptance of toupee was improved toupee craftsmanship, by Max Factor. Factor's toupee were carefully made and almost invisible, with each strand of hair sewed to a piece of fine flesh-colored lace, and in a variety of long and short hairstyles. By 1959, toupee tried to tap into the market by sending out 30,000 special catalogs by direct mail to a targeted list, After that, toupee continued to be advertised in print, likely with heavier media buys (Advertising media selection) taking place in magazines with the appropriate male demographic. By 1970, Time magazine estimated that in the U.S., toupee were wear by more than 2.5 million men out of 17 - 20 million balding men. The increase was chalked up once again to further improvements in hairpiece technology, a desire to seem more youthful, and the long hairstyles that were increasingly in fashion. Toupee and wig manufacture is no longer centered in the U.S., but in Asia, like Japan, Korea and china. Toupee are often custom made to the needs of the wearer, and can be manufactured using either synthetic or human hair. The hair are usually come from these Asian countries: India, Vietnam, Burma and china. Toupee are usually held to one's head using an adhesive, but the cheaper versions often merely use an elastic band. Choosing the right base design is one of the key to have a natural and undetectable unit. 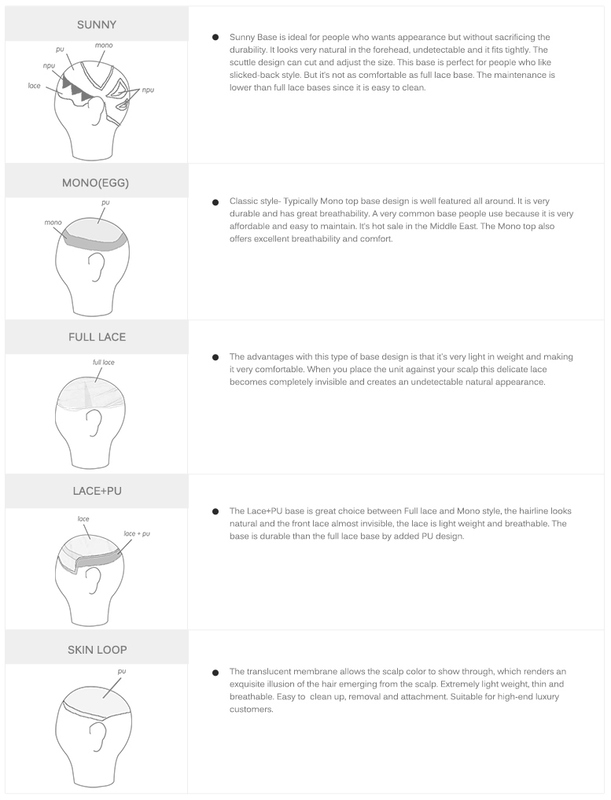 There are more than 40 kinds of the base design, but we only focus on five most commonly used and practical design and make them the best: Sunny, Mono, V-needle, Lace + PU, Full lace. If you want the hair piece look natural and delicate, you must first draw the ventilating direction before you start ventilating. We need to follow the direction of the human hair growing, otherwise, if we disorder the hair growing direction, the hair of the toupee will easy to knot, and not smooth. Using a latch-hook to grab one of the loops on the mono net and pull it down, so that the hook is engaged with the net itself, and then simply wrapped a little bit of hair inside the hook, make sure it engages down and then pull the hair go back and past the little lever so that the hair can engage behind the hook and behind the latch, and then pull the hair go around and pull the other side of the hair go round again, then the latch engage once the hair passes over the loop then simply pull with a sharp motion to get the hair go through, to ties a knot at the loop of the net. This ventilating way is normally used in the top part of the toupee. The way of bake trip knot is almost as same as the double trip knot, the only different part is when the hair can engage behind the hook and behind the latch, pull the hair go around just once, when the latch engage once the hair passes over the loop and then pull with a sharp motion to get the hair go through, to ties a knot at the loop of the net. This ventilating way is the easiest one, but it's not as tough as the two other ventilating ways, it's normally used in the PU part of the toupee. The way of New bake trip knot is also one part different from the bake trip knot, when the hair engage behind the hook and behind the latch, pull the hair go around and cross the other side of the hair then go around again, make them intersect by each other, when the latch engage once the hair passes over the loop and then pull with a sharp motion to get the hair go through, to ties a knot at the loop of the net. This ventilating way is the most difficult one, and it's normally used in the front area, to draw the hairline or create the baby hair. The transitional density hairline replicates nature. Just like real growing hair, the first few millimeters of the High Definition Hairline™ are random and there is a subtle graduation into your normal density level. The hair used in the front is also finer, like a real hairline. 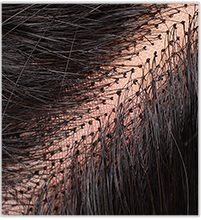 Each strand of hair is affixed to our special lace material in such a unique way that you cannot see where it is attached. Finally, when pressed onto the scalp with our uniquely blended bonding adhesive, the lace completely disappears. The result is a natural, invisible front hairline - even up close! Before you measure, make sure to flatten your hair, use a cloth tape measure and do not pull the tape measure, just rest it over or around your head. Pulling stretches the tape and will give you the wrong size. 1. Measure around your head at the hairline. The "around your head" size of every wig can be adjusted up to 1" larger or smaller to ensure a secure fit. The tape should be just above the ear and along your natural hairline. 2. Measure your head from the nape over the crown to the top of your foreheadwhere your natural hairline is. 3. 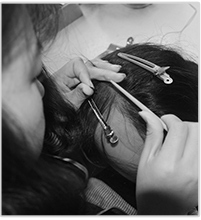 Measure your head from the top of one ear, across the top of the head (crown) and to the top of the other ear. 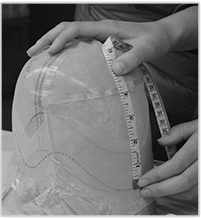 With the 3 measurements listed above, you will have the circumference, the depth and width of your wig cap. You wouldn't just pay a couple hundred to a couple thousand dollars for nothing, would you? Proper care for a toupee can help protect it's longevity and keep you looking great. 2.While you're sitting at home, take it off and put it on a wig stand. The stand will help keep its shape and taking it off your head takes away from your own tugging and pulling hairs out. 3.After washing a wig, do not shake it in a towel. Be careful and dry it piece-by-piece. This makes sure that strands of fibers don't fall off. Also, never style your wig while it's wet. Even those wet-to-style hair stylers are known to damage your wig. 4.After saturating your wig in water, squeeze it dry. Don't wring it or the base of your wig could become mis-shaped and dry funny. 5.While washing your hair, never use shampoo meant for natural hair. ''Even though normal conditioner is OK, the shampoo is too harsh and can lead to hair falling out. 6.You can condition your hair every couple weeks or so, to keep it shiny and soft.Make sure you don't do that every day and be sure to rinse it all out or it could lead to build-up in your wig. 7.Only wash your wig after wearing it for 25 times. If you do this daily or even weekly, it can lead to your wig looking less realistic and falling apart. Why do the hairs fall out of the toupee? It might be caused might be caused by brushing too hard/too often, over-styling, or using too-harsh of a shampoo and conditioner. Low-quality wigs also tend to lose hairs. When it comes to wigs, you often get what you pay for. You can put it in the bag it came in, or you can put it on a wig stand. Keep high and away from pets and children. How do I make a toupee(wig) curlier? If you're looking for wavy curls, you can use a straightener on low heat (on heat-resistant wigs only!). If you're looking for more ringlet curls, you could use rollers and let it sit overnight. How do I untangle the hair of my toupee(wig)? It's frizzy and looks like a mess. You can gently untangle the hair with your hands, and use a conditioner afterwards if needed. I don't have a head or wig stand. What can I use to dry my toupee(wig) on? You can use an appropriately-sized round object (try a balloon) which is tall enough to prevent it from touching the surface underneath. Be sure the wig fits snugly around it to prevent it from stretching or sagging. What is the best shampoo to wash a toupee(wig)? Toupees(Wigs) should only be washed with special shampoo made just for toupees(wigs). Regular shampoo can damage the hairs. Can I use spray on my toupee(wig)? Yes, but not too much, as it will make it clunky and hard to clean later. It also can ruin your wig after a while. Why do the ends of my toupee(wig) get frizzy? It's most likely because of constant use or brushing too aggressively. Wigs are fragile, you need to be really careful when handling them. Do I cut a wig differently from regular hair? No, but be careful, since the hair doesn't grow back. Can I use a curling iron on my toupee(wig)? It depends the type of toupee(wig). When you purchase your wig, you should be able to check if the wig is heat-resistant. If so, you should be able to use a curling iron on it without issue. If you're not sure whether or not your toupee(wig) is heat resistant, it's better to avoid the curling iron and purchase a new toupee(wig) that can withstand the heat.